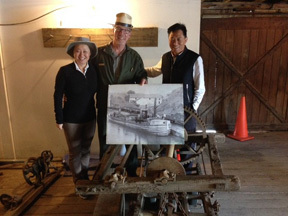 The C&O Canal Trust will be installing 15 new benches in 2018 in the C&O Canal National Historical Park at popular access points between Swains Lock and Cumberland, thanks to philanthropists Daofeng He and his wife Angela Yang Cui. The couple is making the donation in appreciation for the Park and to provide a much-needed amenity for visitors upriver from Great Falls. Daofeng He and C&O Canal Trust President Robin Zanotti signed the agreement in November whereby Daofeng & Angela Foundation will sponsor the 15 benches for six years for a donation of $60,000. It is one of the largest individual gifts ever made to the C&O Canal Trust. The 15 benches will be located at Swains Lock, Seneca Creek Aqueduct, Point of Rocks, Brunswick, Byron Bridge/Harpers Ferry, Lock 38/Shepherdstown Bridge, Snyders Landing or Taylors Landing, Williamsport, Four Locks, Hancock, Little Orleans, Paw Paw Tunnel, Oldtown, Lock 75/North Branch, and Cumberland. Daofeng He, an entrepreneur and nonprofit leader in China, and his wife Angela Yang Cui have retired to Bethesda, Maryland and are big fans of America’s national parks. The former executive president of the China Foundation for Poverty Alleviation, He has been a leading figure in promoting philanthropy in China and internationally. Now the President of Daofeng & Angela Foundation, he continues to travel extensively to promote microfinance and poverty alleviation projects and is a Board Director for Mercy Corps, a global humanitarian organization. Yang Cui, the Foundation’s Director and Treasurer, enjoys hiking the Billy Goat Trail A at Great Falls. The C&O Canal Trust manages the Bench Donation Program on behalf of the C&O Canal National Historical Park. The benches are installed by volunteers from the C&O Canal Association. For more information, please contact Patricia Barber, Director of Development, at [email protected] or 301.745.8880.